Ingalls Shipbuilding celebrated "start of fabrication" for the U.S. Coast Guard National Security Cutter Hamilton (WMSL 753) at its Steel Fabrication Shop in Pascagoula, Miss. Pictured (left to right) are U.S. Coast Guard Lt. Dave Osborne, test lead, hull and electrical; Jim French, deputy program manager, NSC Programs; and Len Janowski, ship design manager, Surface Ship Combatants. Huntington Ingalls Industries, Inc. (NYSE:HII) said that its Ingalls Shipbuilding division celebrated the "start of fabrication" of the U.S. Coast Guard's fourth National Security Cutter, Hamilton (WMSL 753). 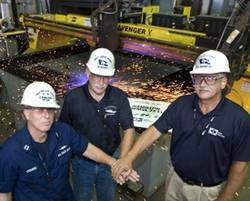 The shipbuilding milestone signifies that 100 tons of steel have been cut and fabricated utilizing a robotic plasma arc cutting machine at Ingalls' steel fabrication complex. Ingalls received the $480 million contract to build Hamilton in November 2010. The ship is scheduled to be delivered to the U.S. Coast Guard in the fall of 2014. "Start of fabrication is obviously one of the most important milestones in the life of a ship," said Mike Duthu, Ingalls' program manager, U.S. Coast Guard programs. "Our shipbuilders are looking forward to keeping this line of production moving forward on National Security Cutters. We're improving ship-to-ship and implementing construction enhancements to ensure the Coast Guard is getting the best quality ship at an affordable price." Ingalls has delivered the first two NSCs, Bertholf (WMSL 750) and Waesche (WMSL 751). Stratton (WMSL 752), the third of eight planned ships in the Legend class of highly capable, technologically advanced multi-mission cutters, will be delivered to the U.S. Coast Guard on Friday. NSCs are the flagship of the Coast Guard's cutter fleet, designed to replace the 378‐foot Hamilton-class High-Endurance Cutters, which entered service during the 1960s. NSCs are 418 feet long with a 54-foot beam and displace 4,500 tons with a full load. They have a top speed of 28 knots, a range of 12,000 miles, an endurance of 60 days and a crew of 110. Ingalls builds the NSC hull and mechanical and electrical systems, while Lockheed Martin builds and integrates the command, control, communications, computers, intelligence, surveillance and reconnaissance (C4ISR) capabilities onboard the cutters. The Legend-class NSC is capable of meeting all maritime security mission needs required of the High Endurance Cutter. The cutter includes an aft launch and recovery area for two rigid hull inflatable boats and a flight deck to accommodate a range of manned and unmanned rotary wing aircraft. It is the largest and most technologically advanced class of cutter in the U.S. Coast Guard, with robust capabilities for maritime homeland security, law enforcement, marine safety, environmental protection and national defense missions. This class of cutters plays an important role enhancing the Coast Guard's operational readiness, capacity and effectiveness at a time when the demand for their services has never been greater.